If you are looking for Vilnius restaurants with a relaxing, informal atmosphere, we think Zaltvyksle is a pleasant place for a lunch or a chilled out dinner. It is more of a café or pub than a restaurant but still presents a nice variety of foods. The interior inside is quite cheerful with walls and furniture decorated in colourful stripes. In summer time, you can choose a table outdoors on the street or in the spacious inner courtyard where live bands play. In our experience the service here has always been very attentive and friendly.Their meals are creatively presented, last time Lija’s avocado and shrimp salad at 4 € came in the cute shape of a boat. I was also happy to find a place where they serve house wine 7 € for a litre. I discovered Cili Pica restaurant on my first trip to Vilnius. Fantastic food quality and excellent value for money amazed me as it was far more than I would expect at a pizza chain restaurant. The emphasis here is obviously on food, which perfectly makes up for the lack of romantic atmosphere and ambiance. Meals are generous, well presented and most importantly, absolutely delicious. I couldn't fault a single dish that I had there on many occasions. The restaurant inside is usually loud and buzzing and it might be hard to find a seat at peak times. It also has outdoor seating on the street when weather permits and a few dining rooms downstairs in the cellar surroundings. They have more than 50 kinds of great pizzas. Other meals include steaks, salads, pastas and delicious deserts. It is very convenient to drop by after clubbing, as it is one of Vilnius restaurants that stays open late till 3 am in the morning on a daily basis and till 6 in the morning on Thursday, Friday and Saturday. Here you can listen to Lithuanian music playing in the background and feel the homely atmosphere. Forto dvaras is also a perfect place to try traditional Lithuanian cepelinai; there are 12 different kinds to choose from. The interior and costumes are reminiscent of a Lithuanian cottage house. 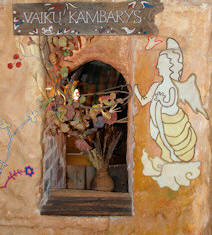 The walls are decorated with pictures from authentic books. 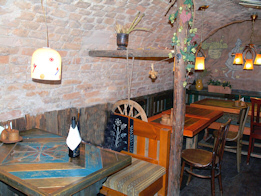 It’s one of Vilnius restaurants that is family friendly and has special surprises for kids. Good value for money.